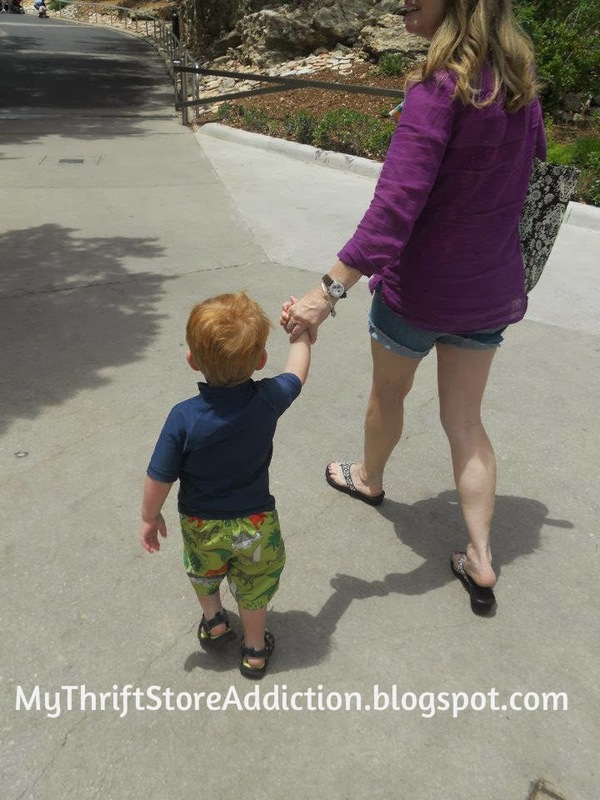 Greetings thrifty friends! 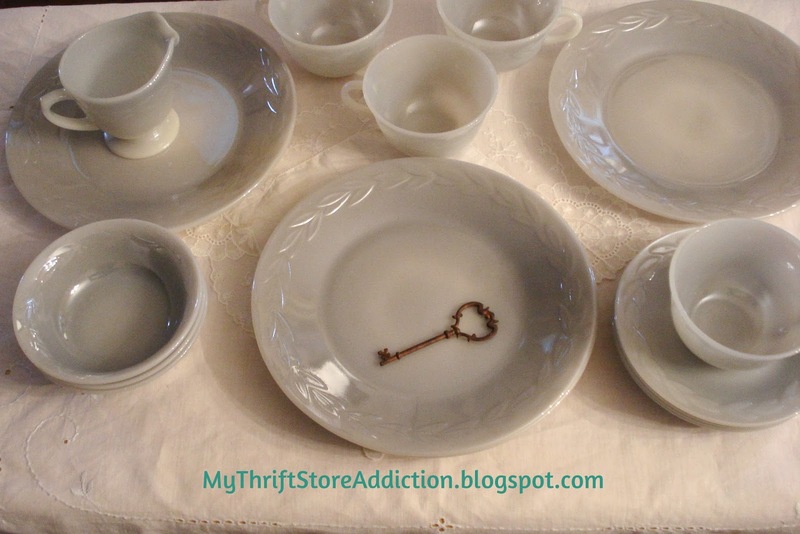 Today I am featuring charming Vintage finds for the kitchen. I adore Vintage lines of all varieties and how cute is this anthropomorphic stitched tea towel?! It is right at home in my kitchen and is already hanging on my refrigerator door. Seasons of Change...and Paint Therapy! Hello Friends, hope you are having a lovely Wednesday. The end of this week will officially mark the first quarter of the year and it already looks like 2014 it is going to be a year of change for me in many ways. First, I can hardly believe that my "children" will be 20, 25 and 30 this year--so hard to believe! Probably the biggest adjustment for this doting Tahtee (Ginger Grand's name of choice for me) is that in less than a week Youngest Daughter and GG are moving out of state. Though I have known for several months, it hasn't really gotten any easier to accept. While I am proud of YD's adventurous spirit and the opportunities they will have, I am saddened that GG's frequent visits and sleepovers will be replaced with only occasional ones. I have great respect for all of you long distance grandparents out there and I am praying for grace to embrace this new season. Refresh Your Home: Four Walls of Gray + Ten Frames of White = One Magnificent Dining Room! Hello Friends, so glad you dropped by today! I am experiencing pre-Spring fever, you know-- that urge to cleanse, refresh and overall brighten my surroundings. I have been wanting to repaint my dining room and update the mocha brown color. Thank God it's thrifty Friday! Today I am featuring these gorgeous thrift store frames and mirrors. I absolutely adore Vintage frames and have been collecting them for my dining room makeover. 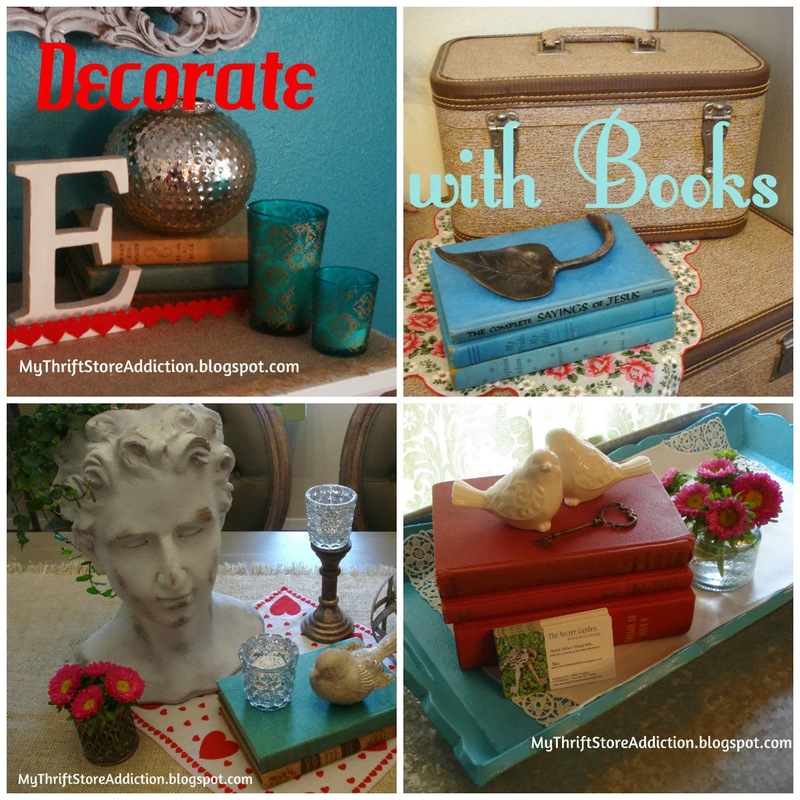 Books as Decor In Any Room! Happy Wednesday Friends! I have entertained a life long love affair with books. Though I often use my Kindle for convenience, truth be told I still prefer the feel of a "real" book in my hands. When I was in elementary school, I would ride my bike several miles (in the snow) to the library and load up as many mystery books as my handlebar basket would hold, really--okay not the snow part! It should come as no surprise that Vintage books were among my first thrifted treasures and to this day can be found in any room of my house! Today I am sharing several ways I decorate with these classics. Greetings! Do your goals for the new year include living a healthier lifestyle? If you are anything like me, there is room for improvement in this area! Today I am sharing one of the simplest ways ever to improve your overall health--drink more water! I am aware that this is not a new concept. However, did you know that just staying properly hydrated alone aids in preventative health? Several little known benefits include keeping skin moisturized, aiding in weight loss, building strong muscles, improving cognitive function and keeping joints flexible. You can read more here. Of course, it goes without saying that water is the most thrifty of all beverages! A few years ago, I decided to try one of these water pitchers made for flavoring your water with fruit and/or herbs--turned out to be one of my best investments ever. I can honestly say I drink at least twice as much water as I did previously! 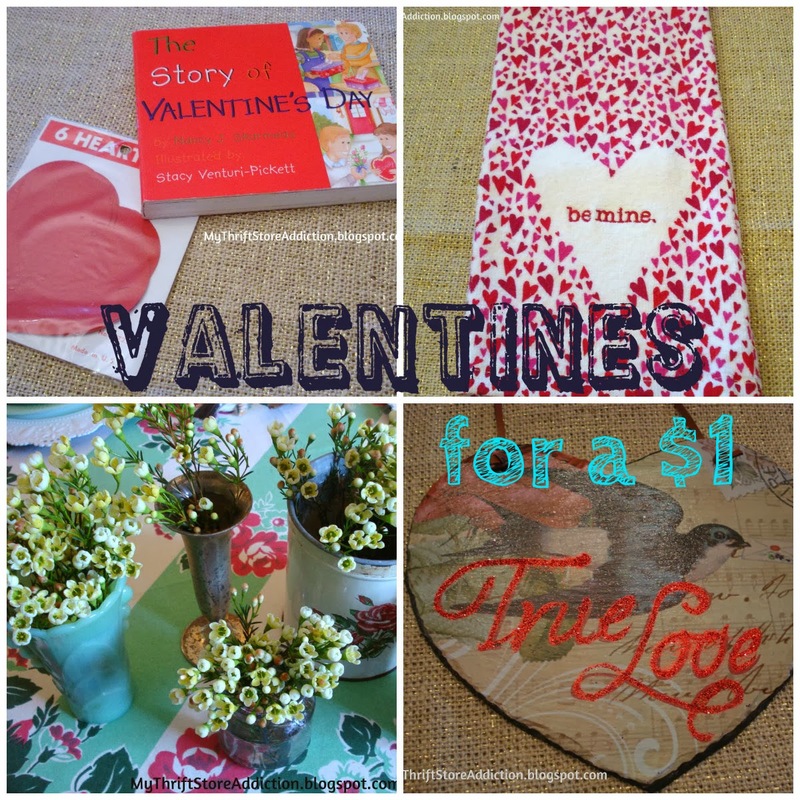 Friday's Find: Valentines Under a Dollar! Happy Valentine's Day, Friends--hope your day is full of love! 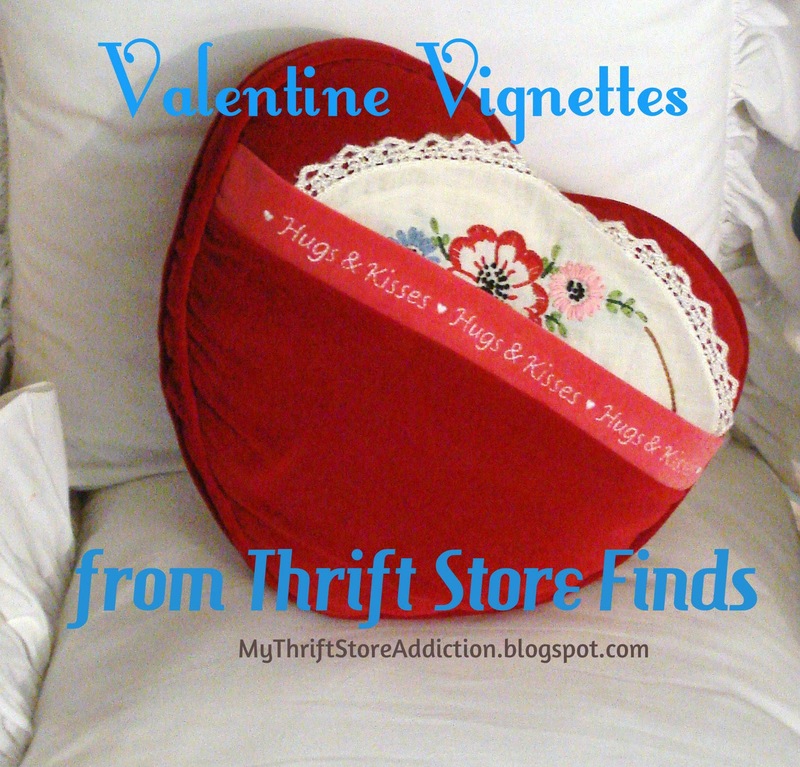 It's thrifty Friday and today I have gathered several finds just for the occasion. Best of all they were each $1 or less! That makes my heart happy! Happy Wednesday! Like many of you, we have had some dreary weather lately. I'm sure I'm not the only one who is ready for Spring! I can't wait to get started in the garden but I'm holding out for some frost free nights before I replant my containers and launch full into my annual Spring fever. Hey, it's Texas and Spring usually comes early here! Looking for other ways to brighten my backdoor view, I decided to make an oil cloth banner--one even my non-sewing friends will appreciate! 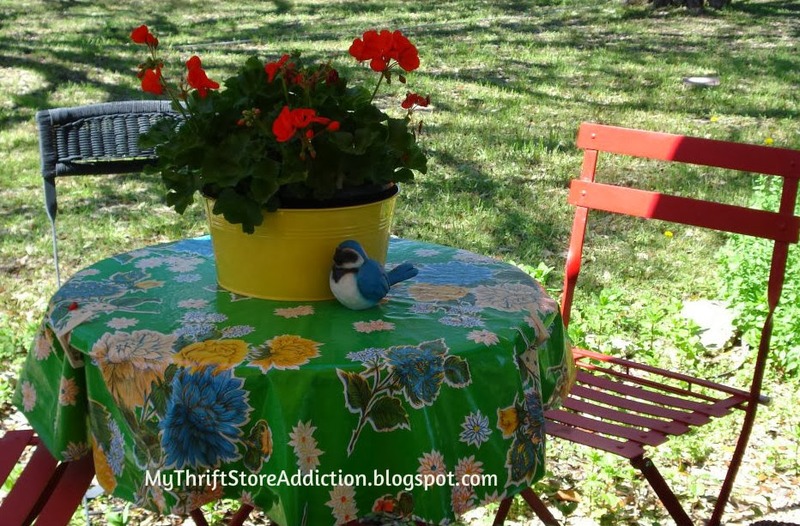 If you haven't tried oil cloth, you are missing out! It is colorful and durable enough to withstand our harsh summers. I cover all of my outdoor tables with it. It can be purchased online and in some craft stores. At my local craft store I pay $5.99 a yard but I have seen it as high as $10 a yard, so you will want to shop around for the best price. The store I mentioned mails out a 30% off one item coupon so I use it to buy the yardage I need for the season. Hello, Friends! Recently I was in my local craft store and a heart shaped red berry wreath caught my eye. A closer look revealed that it was on sale for $19.99. Nope, not going to happen--especially when I had the same kind of berries sitting in my studio! I bet you may have walked past similar strands at yard sales or thrift stores. I know I have on more than one occasion! If memory serves me correctly, I think the price on the one I finally purchased was just too good of a deal to pass up. 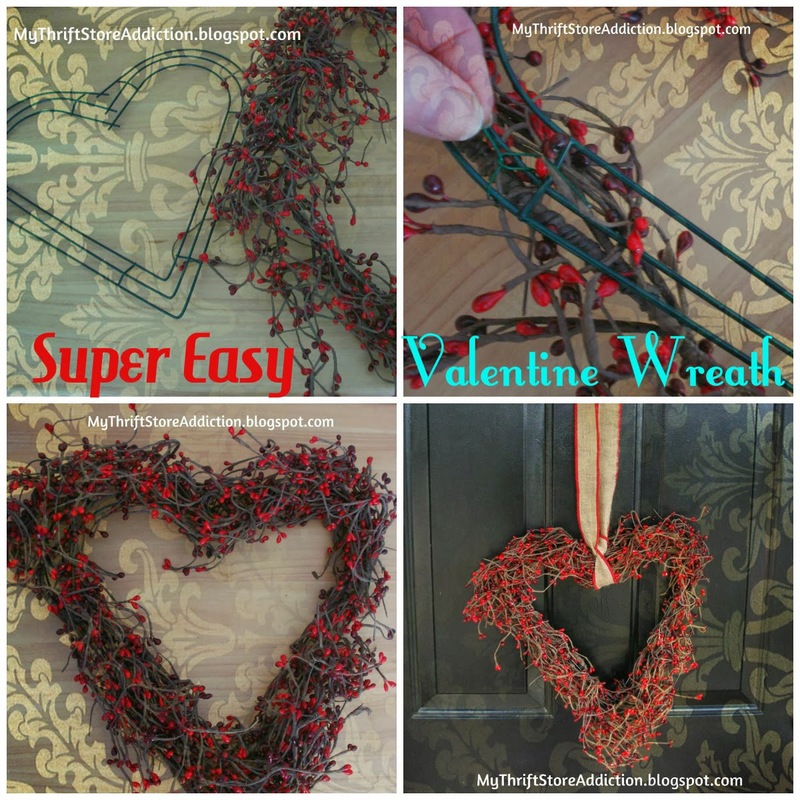 Since I was also in possession of one heart shaped wire frame, I just had to DIY the berry wreath. 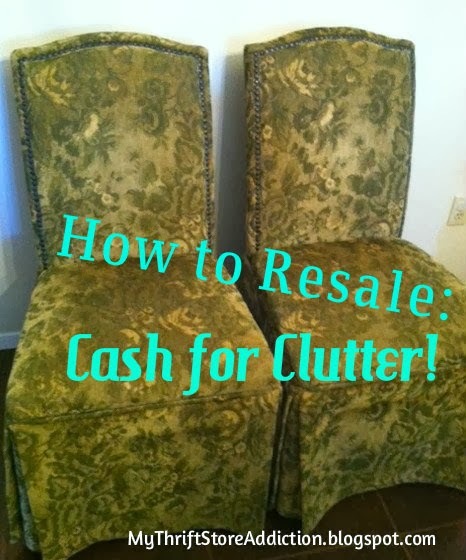 How to Resale: Cash for Clutter! Greetings Fellow Thrifters! Valentine's Day is just around the corner so I thought I would share some heart felt vignettes. I have said it before and I'll say it again: special moments in your home can be lovely without being expensive! Take a look at this chair in my studio, while the velvet heart pillow is the spotlight, the pristine white pillows set the stage. Can you believe I found them in just this condition from an estate sale?! In fact, everything from the chair to the doily were thrifted finds. Tucking a Vintage embroidered doily inside the Valentine pillow's pocket adds instant charm.